Summer fun! Can you tell I’m ready? 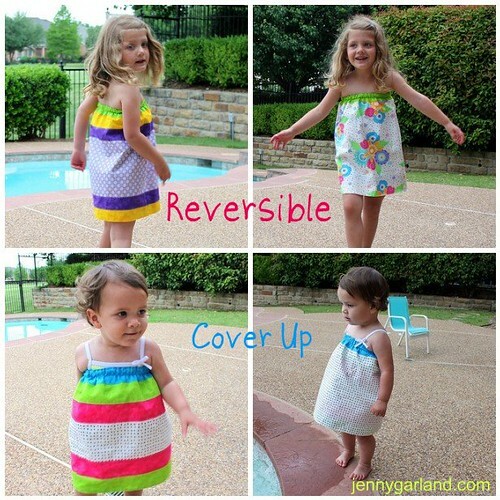 These easy to make swim cover ups are reversible and easy for little ones to put on themselves. Cute and practical? Sign me up, baby. I hope you enjoy the recipe. Feel free to stop by my blog for loads of tutorials and more than you’d ever want to know about these two cutie pies! 1. Take measurements for desired size cover up. Measurements for my 15 month old daughter are in red so you can follow along. 3. 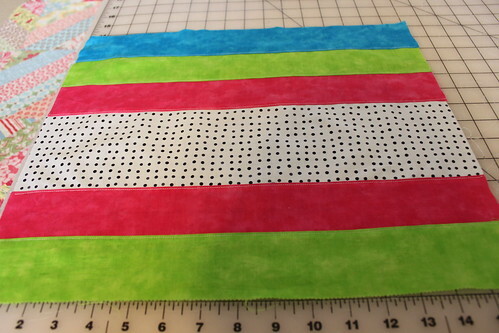 Sew 2 jelly roll strips RST lengthwise. Press open. 4. Trim strip set to Measurement “A” (16.5″). Repeat until you have 4 sets. 5. 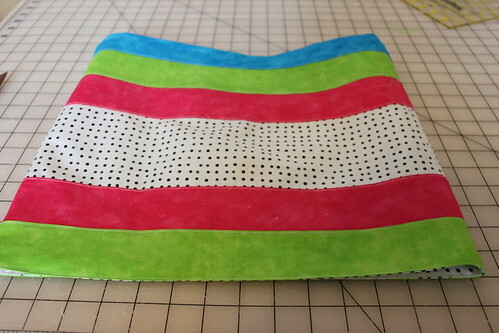 Sew a jelly roll set RST to top and bottom of each rectangle from Step 2. Top stitch seams. 6. Cut 2 rectangles the same size as the pieced rectangles from Step 5 for reversible side of cover up. 7. 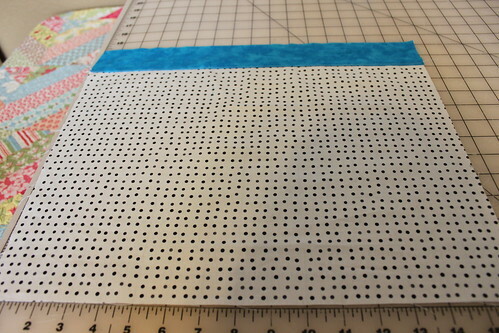 Trim a blue jelly roll strip to Measurement A (16.5″). 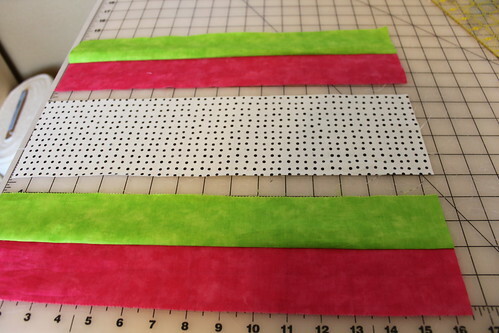 You need a total of 4 trimmed jelly roll strips. 8. 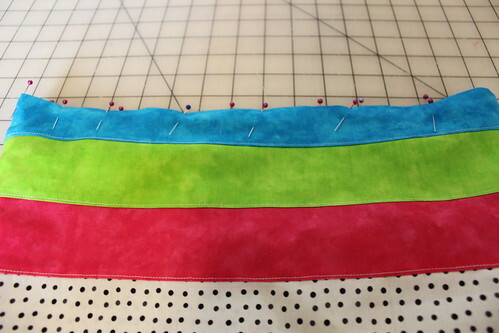 Sew a blue jelly roll strip RST to the top of each rectangle (4 total). Top stitch. 9. Layer 2 matching rectangles RST. 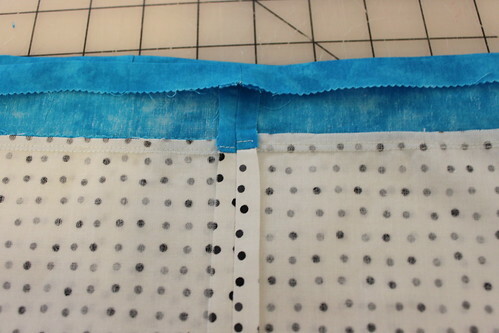 Sew side seams with 3/8″ seam allowance to create tube. Repeat with other matching rectangles. 10. Press seams open. Iron 1/2″ fold to the wrong side of the top of both tubes. 11. Place one tube in the other RST, matching side seams. Pin bottom edge. 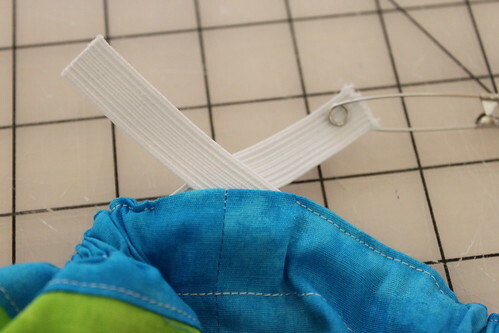 Stitch 1/4″ seam around perimeter. 12. Turn right side out, press, and top stitch bottom edge. 13. Pin top edges together. 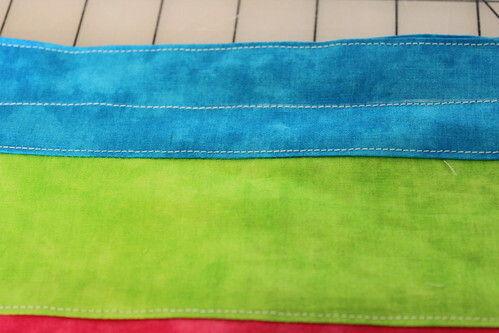 Edge stitch, leaving a 1″ opening to insert elastic. 14. Stitch 3/4″ below edge stitch line along the entire perimeter. 15. Cut elastic 3″ less than chest circumference. Thread elastic. Zig zag ends together to secure. 16. Check fit. Edge stitch 1″ opening closed. One sassy and sweet reversible cover up!